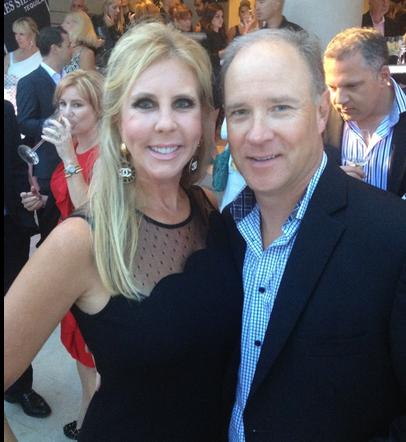 Home / Real Housewives OC / Vicki Gunvalson and Brooks Ayers Are Back Together! Anyone Surprised? Vicki Gunvalson and Brooks Ayers Are Back Together! Anyone Surprised? In case any of you were losing sleep, you can now breathe a sigh of relief since Real Housewives of Orange County's Vicki Gunvalson is officially back on with her deadbeat boyfriend Brooks Ayers. The recent divorcee and mother of two told US Weekly that she and Brooks had a "rough road" and they "fight to stay together". This season of the Real Housewives shows Vicki's daughter's distaste for Brooks and apparently, nothing has changed. Vicki cries, "My daughter and him haven't come to any settlement and they're still at odds. He doesn't really know why Brea just realy won't accept him and that's hard on me..." Hmmm...perhaps your daughter doesn't accept him because he's a fame-hungry deadbeat? But no matter what anyone has to say, Vicki is hanging on to that thang and her daughter and friends' opinions clearly don't mean jack shizz to her. This is like a train wreck waiting to happen but I hope Vick is making the right decision!